Jitter can be assumed to be additive so the inherent noise of the measurement circuit is added to the jitter on the SDI signal itself. The effect of the inherent noise is to increase the width and shape of the Gaussian distribution obtained when analysing Random Jitter. Random Jitter is noise that cannot be predicted as it has no discernible predictable pattern and due to its random nature will have a typical Gaussian distribution over time as seen on a jitter histogram. The measured jitter is effectively the peak to peak value obtained from the Gaussian distribution of samples. The spread of the Gaussian distribution is determined by the level of jitter on the signal and the time taken to measure the jitter (i.e. the number of jitter samples made within the sample period). Ideally the sample period should be infinite to capture all of the possible random jitter events, but this is not practical so typically measurement is made by capturing in excess of 50,000,000 independent samples, multiple times per second then aggregating sample sets to provide the jitter value. If the Noise Floor is higher than the SDI signal jitter, then it can be difficult to accurately measure the signal jitter is due to the combined SDI signal jitter and the Noise Floor. Here the Gaussian distribution will be wide compared to that of a low Noise Floor, where the Gaussian distribution will be narrower. The peak to peak value, over an infinite sample period, is effectively the same for both high or low Noise Floors. Over short time spans, however, subsequence measurements may be different due to the random nature of jitter. 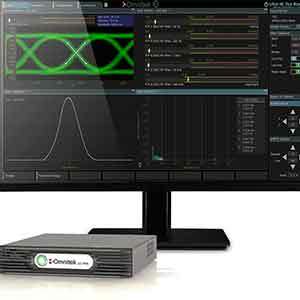 With more and more 12G-SDI equipment and converter boxes on the market, some without the re-clocking stipulated by SMPTE, the need to be able to accurately measure the accumulated Jitter Transfer in the signal path is vital. The Omnitek Ultra 4K Tool Box was the first on the market back in September 2015 with the only viable 12G-SDI Physical Layer Analysis measurement equipment which used the chip technology available at that time. The latest generation of the Omnitek Ultra 4K Tool Box (Model G) benefits from the latest chip technology so now the Ultra 4K Tool Box can once again boast the lowest Noise Floor of any currently available T&M equipment of its type. This benefits new, and existing, customers alike as they can get the best possible jitter measurement. The new Model G has a lower Noise Floor compared to competing solutions, and previous models, which means that lower levels of 12G-SDI signal jitter can be more reliably measured with improved repeatability. The new circuit design minimises the need for unit calibration, reduces the calibration cost and therefore reduces the cost of ownership. There is an upgrade path available to all existing customers of Ultra 4K Tool Boxes with the 12G-SDI and PHY options. Contact a local Omnitek dealer or by visit the Omnitek web site for details.